1. Brown the meat in batches in a little oil in a casserole dish. Scoop out then brown the onions and mushrooms. Add the meat back to the pan then sprinkle over the flour and stir for a minute. Add the ale gradually then bring to a simmer, put on a lid and cook for 2 hours, or until tender. Cool a little. 2. Roll out the pastry to 20p thickness. Dot the blue cheese all over one side then fold and roll out again so the cheese goes into the pastry. 3. Heat the oven to 200C/gas 6. 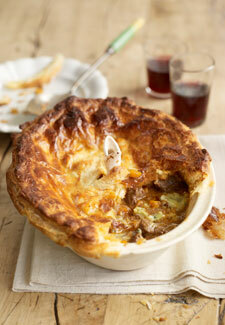 Tip the steak mix into 4 individual pie dishes. Top with the pastry, trim and brush with beaten egg. Make a hole in the top of each then bake for 25-30 minutes until puffed and golden.